Community governance consists of a set of policies established by enterprise community managers and system administrators that are continuously monitored and enforced by the policy owners and members of the community. Simply stated, governance policies are developed in order to define and clarify what members can and cannot do within the online community. A community that has no rules can be valuable and effective, as well as meet business requirements. However, without policies in place, your community may become encumbered by inconsistent terminology or duplication of groups and content, resulting in various degrees of user confusion. That is where a governance strategy comes into play. Ideally, for internal communities, or social intranets, we recommend starting with an open approach, meaning all users can post content in any place. External customer communities may have stricter permissions around content creation, for example, restricting users from uploading documents and files but allowing them to post questions or start new discussion threads in specified spaces. Authentication: Limit posting capability to registered users only so that there is a minimum amount of required identification (e.g. username), while all other users can freely consume online content. Permissions: Decide who can/cannot create new places. For example, you may have one policy stating that all newly created spaces require some level of formal approval, but a second policy stating that private group spaces created by registered users do not require formal approval, but will be monitored nonetheless. Sanctioned Content: Allow a set number of members to post documents, deemed “official and sanctioned”, but allow all users the ability to post free-form comments that are neither moderated nor sanctioned. There are no set rules for community governance, as every community is unique. Additionally, these rules can be modified over time and will most likely evolve as your community grows and matures. At Social Edge Consulting, we can provide direction starting with a set of variables and recommend the best course of action that meets your online community's needs and requirements. We identify community goals, create an information architecture and develop a community governance strategy that aligns with your overall objectives and use cases. 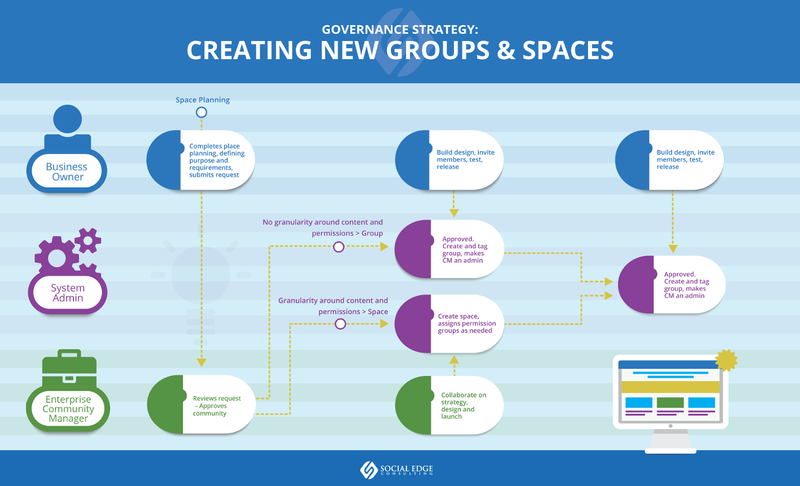 Additionally, we can help map out your governance policies around membership and access, user registration, content uploading, place creation, integration points, and the granularity of what users can/cannot do. Interested in learning more about governance strategies and best practices? Leave a comment below or email us at contact@socialedgeconsulting.com.